It’s thought that the castle’s original foundations date back to the times of the Etruscans, but the first documentation is from 1042. At that time the castle belonged to a Count Pietrone. 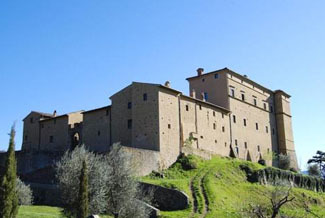 Over the centuries the castle passed through the hands of several noble Tuscan families: the Tolomei, the Bonsignori, and the Salimbeni, who once hosted Saint Catherine of Siena at the estate. By the end of the 16th century, the hospital order of Santa Maria della Scala used it as a center for their charitable works. By the 20th century, the castle had fallen into a sorry state of dilapidation. The Greenes had already bought, restored, and sold one castle in Tuscany, and then discovered Potentino from a guide book. Despite its abandoned and overgrown appearance, they realized its fantastic potential; the only problem was that the property was owned by 22 different people, and each had to sign off on a sale. Finally, in 2000 the Greenes took ownership and restoration began. You’re part of a family-run castle estate that offers rooms on a bed and breakfast basis—not as a hotel with all the facilities. That said, groups of up to twenty can be accommodated on a weekly basis or any arrangement you wish. Seggiano is located in the province of Grosseto, about 65 km (or an hour south) of Siena. The castle is about 1 km. west of SS323. The best way to enjoy the area is with a car. Yes. Private chapel on site. Inquire hotel for details. Nestled in a stunning valley in an off-the-beaten-track corner of Tuscany, this wonderful, Renaissance castle is part of an family-owned organic farm that produces prize-winning wines and extra-virgin olive oil. Join in the cooking, taste the wine, or take part in the farm’s activities as much or as little as you wish for an authentic Tuscan experience. The peaceful and homey atmosphere here is ideal for relaxation and exploration of the surrounding region. Your hosts, the Greene family, can even arrange wine tastings and lunches at other estates. Unique guest rooms can feature wood beams or painted frescoes on the ceiling. All are furnished with antiques. Double and triple bedrooms come with en suite bathrooms and four poster beds. A couple of self-contained apartments are available as well. If you’re on a bit of a budget, the castle offers single and double rooms with a shared bath. Throughout the castle you’ll find sitting rooms filled with books and comfy couches. You are welcome to have a home-cooked meal with the family, self-cater, or dine at one of the nearby recommended restaurants. Wi-fi is free. Through July 2017, two weekends a month are devoted to “Study of the Senses.” Classes and events will explore topics such as perfume making, wine, chocolate, and cheesemaking.